Hours after high drama and frenzied bidding, Mahatma Gandhi's personal belongings were bought for USD 1.8 million by industrialist Vijay Mallya, who said he "bidded for the country" at the auction after last-ditch attempts by India to stall the sale of the memorabilia fell through. Just before the auction, owner of the items James Otis had agreed to withdraw them from the auction but the auction house did not agree. It argued that it could have a big liability if it allowed the items to be withdrawn from the auction as more than 30 bidders had already registered for them and some have even sent in written bids. 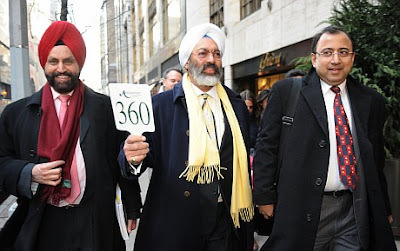 As soon as the auctioneer announced sold, a large number of Indian-Americans who had come to witness the auction or to bid burst into loud round of applause. The auction activity was suspended for several minutes as the community leaders congratulated each other. The community leaders expressed relief that the promise of keeping Gandhi's iconic items, including his glasses, sandals, pocket watch, plate and a bowl, in India has been fulfilled. But the sale would take two weeks to finalise. The items would be kept with the Auctioneer for two weeks to resolve any claims. Tony Bedi, who bidded on behalf of Mallya said that he was "bidding for the country" and this sale means that Gandhi's items would now return to India. The US Justice Department, whose intervention was sought by the Indian government to implement the injunction issued by the Delhi High Court against auction of Gandhi's belongings, had earlier sent a notice to Antiquorum Auctioneers that items be not transferred to the buyer and kept in escrow account until it takes a view on the Indian request. But it had allowed the auction go on. Just before Gandhi's items went under hammer, the auctioneer explained the position and said it plans to keep the items for two weeks pending the decision of the Justice Department. Mallya's move came as a total surprise as his name was never mentioned among those who might bid for the items. The bid on the floor was made by his representative Bedi and it was not until the auction was over that the liquor baron's name surfaced to the surprise of everyone present. One of the bidders was a South African, who was very much interested in the items. Bids were received over the phone and Internet from overseas. None of the bidders were identified. So much interest was aroused that the auctioneers showed a small clip of Gandhi's everyday activities before bringing his belongings to auction. And the bid increased so fast that it was impossible to keep track. Within three minutes, the bid had reached USD one million. After that it slowed downed a bit but picked pace against. Once it reached USD 1.8 million, the person auctioning the items waited for quite a while before bringing down the hammer. Originally, Antiquorum Auctioneers had fixed the base price of the items between USD 20,000 and 30,000 but the media hype and interest shown by the Indian government helped to shoot up the prices and bid itself began around USD 300,000. After the auction, Chairman of the auction house Robert Maron expressed satisfaction that the items would go back to India and explained his position as to why the auction could not be stopped. For hours before the auction started, Indian American leaders had consultations on the strategy at the Indian Consulate here with top Indian diplomats including Consul General Prabhu Dayal. Talking to reporters, Sant Singh Chatwal, a leading hotelier and community leader who took lead in the negotiations, said it was decided that Indians would not bid against one another as it would have sent up the price. It was decided that Mallya would bid for the items, Chatwal said, adding he had been in touch with him throughout. Chatwal too had shown interest in bidding for the items and repeatedly asserted that Indian American would not allow them to be bought by a private collector. During the auction process, Chatwal and Bedi were sitting side by side and were seen consulting often. Confusion over whether Otis could take the items off the hammer prevailed with contradictory statements being made by him. He had made a proposal with tough conditions to the Indian government on Wednesday which, analysts said, were impossible for New Delhi accept. But even in the unlikely event of India accepting Otis' proposal, in all probability, the auction still could not have been stopped in view of the position taken by the auctioneers and in terms of contract signed by him with them. Though Otis' lawyer Ravi Batra said he would not take any action for auctioneers going ahead with the auction despite his last minute bid to stop it, the Antiquorum officials assert that Otis has no case once he has handed over the items to them for sale under the contact signed by him.